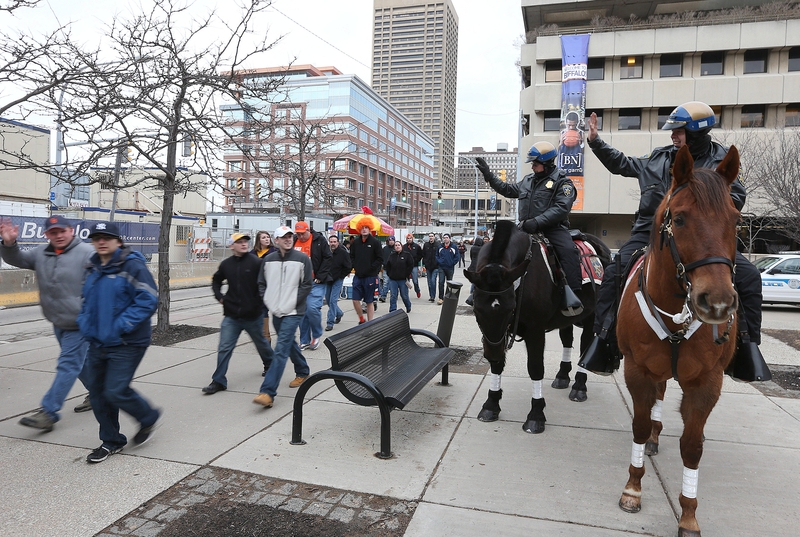 Mounted patrolmen from the Erie County Sheriff’s Office greeted NCAA fans on their way to First Niagara Center for the men’s basketball tournament Saturday. For Pete Harvey, March Madness in Buffalo could not have come at a better time. Harvey, director of sports development at the Buffalo Niagara Sports Commission, will be in Oklahoma City next week for a huge annual sports tourism trade show, attempting to lure other amateur sports tournaments into Western New York. “They’ll all know that I’m just coming off of this event,” he said. In the world of sports tourism, there may be no better conversation starter than the NCAA men’s basketball championships, the highest-profile amateur athletic tournament of them all. And Harvey will try to persuade a variety of event operators – big and small and in any number of sports – that if Buffalo can tame March Madness, it can handle just about anything. The NCAAs generate tons of attention and inject an estimated $5 million into the local economy when they roll into town, as they have now five times since 2000. But big-time basketball is just the tip of the iceberg of what is a continually growing amateur sports tournament market in the United States. And Western New York has been feasting on Americans’ love of sports for years, especially with its hosting of youth hockey and swimming events. Thursday through next Sunday, for example, about 300 young people from across the Eastern seaboard will be competing in the 2014 USA Swimming Speedo Champions Series Eastern Zone sectionals meet in Erie Community College’s Burt Flickinger Athletic Center. Then, a week later, April 2-6, Northtown Center in Amherst will welcome more than 600 girls for the Tier II USA Hockey National Championships, drawing families from as far as Wyoming and Alaska for the tournament of 36 teams. Tournament organizers here anticipate the event will fill 600 area hotel rooms per night, each of the four days of the event. “On a consistent basis, hockey has been very good to Buffalo, and I think it will continue,” said Robert A. Schell, tournament director for Amherst Youth Hockey, which earlier this month also hosted a tournament for 48 teams from across New York State. Next year, Amherst will host the boys USA Hockey National Championships, after San Jose, Calif., which originally won the bid for the event, had to pull out because of a lack of hotel availability that week. About 165 volunteers have agreed to assist with the girls’ tournament, said Schell. The Buffalo-Niagara region also has made pitches for lesser-known sports competitions, such as BMX racing, mud runs, Ultimate Frisbee, jet skiing and hydroboating. “They’re not always the mainstream things you think about. But it’s heads and beds and people spending money in restaurants,” said Harvey. In 2012, about 1,000 martial arts athletes from as far as Ireland and Guatemala competed in the Super Grands World Games & Amateur Internationals. And this July, 1,500 contestants are expected for the National Horseshoe Pitchers Association World Tournament at the Hamburg Fairgrounds event center. The tournament will last 12 days and have an economic impact of $2 million, according to Visit Buffalo Niagara, which takes into account the amount visitors in town for the sporting event likely will spend on food, lodging and other items during their stay. “It’s a big event. They get enormous crowds for that. It is a big ‘get’ for a city,” said Jason Gewirtz, managing editor of SportsTravel magazine, a monthly publication that tracks trends in the sports tourism industry. Harvey said he’s planning to submit a bid this week for a U.S. Speedskating event to come to Buffalo, possibly later this year. “If this event comes here, we’ll have some of the skaters from Sochi,” he said. Its hosting of major events such as March Madness, the Frozen Four and the World Junior Ice Hockey Championship has burnished Buffalo’s image in the highly competitive sports tournament market. Of course, the presence of the NCAA tournament in Buffalo might not matter at all to operators of smaller, lesser-known events. But Western New York’s success in hosting youth hockey and swimming could definitely be a draw for other youth tournaments on a similar scale, such as soccer, said Donald G. Schumacher, executive director of the National Association of Sports Commissions, a trade organization based in Cincinnati. Beyond First Niagara Center, which is considered a first-rate venue for big-time sports, Western New York has depth and quality in its sports facilities, said Schumacher, who did an analysis of the Buffalo Niagara region a few years ago. In addition, the area has attractions outside of sports that families enjoy. “These family trips to a tournament are more than competition. They’re also trips to see other things,” said Schumacher. Visitor spending on sports travel in the U.S. last year was $8.7 billion, according to Schumacher, up from $8.3 billion in 2012 and from $6 billion about five years ago. “Despite the recession, our business continued to grow, and leisure travel and business travel did not grow. They fell off,” he said. David Hart, president of Hart Hotels, said the amateur sports travel industry is “almost a recession-proof type business” because no parent wants to deny his or her child the chance to compete. “The last thing you’re going to do when the family budget is crunched is cancel your kid’s trip to a sporting event,” he said. Area tourism officials began focusing in the mid-’90s on snagging amateur sports tournaments, after Erie County hosted the World University Games. The Flickinger Center downtown and the track-and-field and football stadium at the University at Buffalo were built to help accommodate the games, and have subsequently hosted other tournaments. “We made a very conscious decision that we were going to start doing these big amateur athletic events,” said Michael Even, vice president of sales at Visit Buffalo Niagara. The total economic impact of such events varies from year to year, he said. Hart said amateur sports have become so critical that Hart Hotels dedicates a segment of its sales force specifically to that market. March Madness is a nice shot in the arm for hoteliers, but it only comes along every few years. “The real meat and potatoes is all that amateur athletics that comes throughout the year,” he said.